For awhile, Richard and Sian were quite a happy couple. Even the simplest things - like sharing a smile or an afternoon nap - pleased them. Above, Richard often had a look of love on his face. Below Sian was already showing signs of fear at the loss of his love and left, unfortunately it couldn't last forever. Nothing evokes such sad and nostalgic feelings as flipping through a photo album filled with scenes from a once-happy love affair that is no more. As time goes by, however, it's hoped that the ill-fated couple will be able to look at the pictures with no regrets and perhaps just a twinge of bittersweet memory. But if a person is especially romantic, it usually takes a fairly long time to place the reminiscence in its proper perspective so it's no longer painful but just a pleasant recollection. 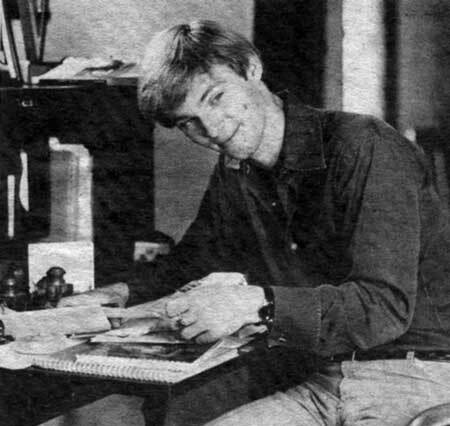 And since there's probably nobody more romantic than Richard Thomas-both in the role he plays as John-Boy on The Waltons and an real life-we can't at help but wonder if he didn't have a tear in his eye and a lump in his throat as he looked through the results of a photo session with Movie World's photographer. The photos you see on these pages were taken during the last few happy weeks of the beautiful love affair between Richard Thomas and Sian-Barbara Allen. Lately they have been seen dating others, but we feel sure that when Richard Thomas' book of poetry is published this fall, several of the verses will memorialize the happy times he shared with Sian-Barbara. It was well-known that the two of them shared an intimate and loving relationship, though each declared openly that they wanted to further pursue their careers before marriage was even considered. Some friends privately asserted, however, that they thought Sian-Barbara would have been only too happy to least partially give up her career and settle down as Mrs. Richard Thomas. Perhaps because Sian's father, after whom she was named, died when she was an infant, the actress is more desirable of establishing her own home and family than is Richard, whose parents have had a fulfilling life together as operators of a ballet school in New York. Even Sian-Barbara's mother admits that her early family life left much to be desired, explaining, "I went through two miserable marriages after Barbara was born." She adds that the period was "so bad that to talk about it seems unreal." Is it any wonder then she would want her daughter to make a happy marriage'? "I liked him very much. He's so sweet and he's got so much charm and vitality. He wakes up that way," she once told an interviewer about the once-frequent visitor at her home. "I can't think of anything I don't like about Richard," she declared. In fact, she admitted that Sian-Barbara once told her, "We both cannot see ourselves with anyone else, either now or five years from now." She added that" Richard described their relationship as being "halfway between good friends and engaged." "My great romance right now is with my house and my own time," he adds hastily. His house is a Spanish, Tudor-style cottage in Beverly Hills. "Do you realize for somebody who was reared on the 15th floor of a 96th Street apartment what it's like to have a house with roses, and a lemon tree that makes lemons'?" There was a time when Sian-Barbara used to sit under that lemon tree with him and they'd dream about the future. Now Richard just says, he has "lots of friends, but I don't see a lot of them, and that's why we stay close - that sounds terrible, doesn't it?" Sian-Barbara apparently didn't waste too much time sitting around moping over her lost love. She showed up at the - Tony Awards ceremony in New York holding hands with director Tom Moore, whose Broadway musical Over Here with the Andrews Sisters was one of the nominees. At about the same time, Richard was going it alone as parade marshall for the Kentucky Derby, attended by such international celebrities as Princess Margaret of England and her husband, Antony Armstrong-Jones. So maybe Richard was more broken-hearted over the disintegration of his romance with Sian-Barbara than he would let on toanybody. But Richard was keeping busy with his career-such as playing opposite Sarah Miles in Saint Joan at a Los Angeles theater. And he says he'd like to make another movie, a Western. "I'd like to play a gunfighter-I'm such a Western type." So it looks as though neither Richard nor Sian-Barbara is exactly sitting around pining away for their lost love. Each has a career and new friends to help them recover from the pain of "breaking up". But we're sure when they look at these photos they feel more than a bit nostalgic over the beautiful romance that was and perhaps never can be exactly the same way again.